Mark Wadsworth: Do you still stand by your comment of a couple of years ago that if the electricity generators were left to their own devices (without subsidies or penalties or other government interference) then they would probably go for gas or coal rather than nuclear or wind-power? If you had a couple of billion in the bank and wanted to go in electricity generation, what would you choose? Alan Duncan: I do still believe that the market is much better qualified to decide on the mix of generating sources rather than Government ministers. I believe that the role of Government should be to set the right framework of incentives reduce emissions, including a long term price for carbon, and ensure energy security. It is important that this framework is set out for the long term, so that investors have the opportunity to invest in projects with high capital costs and a long term return or to invest in projects were the return is currently more marginal. I believe that there is a risk that without the right framework of incentives, the default option for generators will be to invest in new gas or coal plants rather than in lower carbon emitting alternatives. Nick: Our recent local election showing in one of our top target constituencies - Tynemouth - was less than great. There was essentially no change, and in some areas the Labour vote went up. As Shadow Minister for Tyneside, which issues do you feel appeal to people in the North? To put it another way, are the politically correct, enviro-luvvy ideals of Islington and Notting Hill the right line to be taking to win on Tyneside? It was disappointing that Labour gained one seat (previously held by an independent) on North Tyneside Council, but with 28 seats we are still the largest party. The performance in Newcastle and Gateshead was also disappointing but I wasn’t expecting a massive breakthrough this time around. We have to be clear; the Conservative Party has been behind in areas like Tyneside for a very long time. Our position has been slipping for a ages and once a political organisation falls to a certain level of political support it is too easy to slip of the radar entirely. I think that things are beginning to change. I have been welcomed in the North East and there is very little of the anti-Conservative hostility you might have expected a few years ago. We need to continue building our organisation showing that we are there in the North East and that we really do care about the same issues as local people. I don’t buy the argument that the transformation of the Conservative Party is turning off voters in the north. It is true that the party is doing a lot better in the South East, but the improvements in the North have been less marked. I don’t quite see how this can be interpreted as suggesting that people in the north care less about the environment, or rebuilding communities with a sense of social responsibility, or improving our public services. It might well be that we need to work harder in areas where our support has been weaker to let people know that the Conservative Party is addressing the areas they care about. Any questions for Alan Duncan? 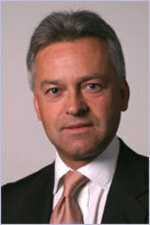 Alan Duncan has been the Shadow Secretary of State for Trade and Industry since December 2005. He was first elected as MP for Rutland and Melton in 1992 and served as PPS to the then Party Chairman Brian Mawhinney in his first term. In Opposition he has held a number of frontbench positions including as Shadow Secretary of State for Constitutional Affairs and Shadow International Development Secretary. Before entering Parliament Alan worked for Shell International Petroleum, and subsequently for an independent commodity company as a trader of crude oil and refined products. He lived in Singapore from 1984-1986 and, since 1989, has owned his own oil broking and advisory company. He has travelled extensively, especially in the Middle East and South-East Asia. You can leave your questions for Alan Duncan in the thread below of email them here.